Can you sense the silent majority and the change they really want? For the first time since the Gallup Poll has been asking the question in 1995, a majority of Americans call them self “pro-life” on the issue of abortion rather than “pro-choice.” The Gallup poll found that 51% of American consider them self “pro-life” while 42% are pro-abortion. The new results, obtained from Gallup’s annual Values and Beliefs survey, represent a significant shift from a year ago, when 50% were pro-choice and 44% pro-life. 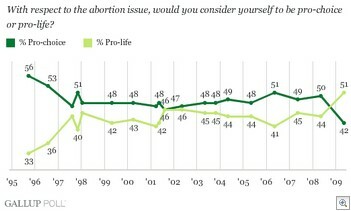 Prior to now, the highest percentage identifying as pro-life was 46%, in both August 2001 and May 2002. The Gallup poll shows an even greater number of Americans “pro-life” than a FOX News polls this month showing 49 percent of Americans as pro-life and 43 percent as pro-choice on abortion. Do the majority of Americans think a baby is a punishment like Obama says? He also signed legislation to use taxpayer money to kill embryos in research. Democrats are pushing legislation that will force healthcare providers to perform abortions even if it violates their moral or religious convictions. Barack Obama even voted 4 times to support infanticide during his political career. Right Wing News is dead on in their analysis of this shift of ideology and represents a tipping point in America. The shift is not a knee-jerk reaction to a single event, but in fact a slow and methodical 18 point swing to “pro-life” from a nation in 2005 that found itself 56%–33% pro-choice. This pro-life revelation brings up a point that many made and liberals tried to capitalize on following the Obama-McCain Presidential election. People said that Republicans lost because they were out of touch with America. Oh contraire mon frere, Republicans lost because they forgot what it meant to be a Republican and ran as Democrat-lite. This is exactly the same point that they are making at American Power and the fact that Obama risks alienating many voters by his far-left abortion position. One America gets over their Jimmy Carter/Barack Obama social experiment and realize what they have done … 2010 and 2012 they will be ready for more CHANGE. The following is an interesting perspective from Marjorie Dannenfelser, president of Susan B. Anthony List, as reported at Town Hall. Americans over time have finally understood what choice really means. This is the “pro-choice” wording that was market tested by the pro-abortion movement. They put a lot of money into finding the right phrase, and they came up with a fabulous phrase. And it worked for them. But its taken a while for folks to figure out what pro-choice really means. We’re not talking about vanilla and chocolate. The sleeping giant has been awoke. This issue has been bubbling under the surface for quite some time and the LEFT has pushed the envelop way too far. Federal tax $’s going to pay for abaotion overseas, and the partial birth abaotion issue has really made people take a look at what “pro-choice” really means. Hey guess what? “Pro-Choice” doesn’t mean “Pro-Abortion.” It means you believe people should have the freedom of choice, not that you think abortion is awesome. It’s just like when people say “Oh you’re against the troops if you don’t support the war.” or “If you aren’t a Christian, you worship Satan!” It just makes no sense, so please everyone put a lid on the stupid attempts to put words in the mouths of others. SM: Sorry Charlie, yes it does and the American public is finally understanding it. Please do not try to compare apples and oranges. It was a cute little marketing scheme dreamed up by liberals. The gig is up. Glad to see the things turning around for the better. the only way you can put a good face on abortion, particularly partial birth abortion that obama condones is to consider it a mercy killing saving the child from a tortuous life being reared by a mother callous and uncaring enough to even consider an abortion like that. I never understood this anyway.. How can a woman have an abortion up to 6 months I think..don’t quote me on that number..and its legal…coz it’s not a baby.. but..if a man kills his pregnant wife..it’s a double homicide? Or if he hits his wife..and she loses a baby, he can be charged with the baby’s death.. OR Dr. Kevorkian.. can go assist able bodied adults who are sick and want to die.. to help them die peacefully..and he does time for murder.. I would love for the govt. to explain how these stupid laws came about. His words were I don’t want them punished if they make a mistake. I don’t want them punished with having a baby or std. WTF? Don’t you think they should take responsibility for their own actions? Since when is having a baby punishment? It is not okay to kill a baby because you make a mistake. Be responsible, have morals. Don’t send the message that if you make a mistake it’s okay, we can fix it by murdering the baby. What have you learned from your mistake? making a mistake OR punishment. Babies are a gift from God. Babies are a gift from God as you stated so therefore they should not be considered a punishment and they should have the right to live. what do you care if somebody wants to get an abortion. Because I’m pro-life not pro-choice. Abortion is murder, that’s why I care.